What I Learned this Fortnight! A video that went viral showing very emaciated looking sun bears begging for food from visitors has turned people’s heads to the zoos in Indonesia. An expert at the Sun Bear Center in Boreno said, “There seems to be a lot amiss when [with] the sun bears' behavior.” The video was captured in 2016 at the Bandung Zoo, and since then, several hundred thousand people have signed a petition for the zoo to close. Experts of animal welfare have said that the Bandung Zoo is not even the worst zoo in Indonesia. Gabriella Fredericksson noticed many things amiss with the video. First, the animals begging means they are used to being fed by visitors, which is not the proper diet for the bears. Secondly, she saw that the bears were lactating, which is a sign of unmanaged breeding, and can lead to the death of the cubs. Also, the foot pads of sun bears are very sensitive and walking on concrete breaks them open, and then causing them to get infected. The lack of shade can hurt their eyesight and lastly, too many sun bears are in the same enclosure. In the wild, sun bears are solitary animals. Surabaya Zoo is another institution that does not care for the welfare of their animals. A giraffe was found dead with 40 pounds of plastic in it’s stomach. A lion was found tangled in wire and had strangled to death. A white tiger starved to death because he had a tongue injury that had not been operated on. Elephants have their feet shackled so they cannot walk around the enclosure. In the wild, elephants travel up to 30 miles a day and are very intelligent, social animals. These bad conditions have a wide range of causes. The zoo makes ticket fees about 6,000 to 10,000 Indonesian rupiahs, which is 50-75 cents. That is about the cost of a nasi bungkus, a street food dish of rice on a banana leaf. When the cost of a ticket is that low, the staff cannot be trained properly, keep the premises clean, buy some enrichment items to stimulate the animals brains, and improve the small concrete enclosure. Instead of learning opportunities and conservation projects, Indonesia sees zoos as entertainment; lions, elephants and tigers are just cash cows. Zoos will even breed animals more often, because cubs attract more visitors, without even a thought of how they will feed those extra animals or where they will be placed. Indonesia’s Ministry of Environment and Forestry said that only 4 out of the 58 registered zoo’s were “decent and appropriate.” Taking wild intelligent animals out of their natural environment and putting them in a small enclosure with barely any food, is like prison. Those beautiful creatures are like inmates, and humans are the guards. These animals are trapped, and we can help them. To help, you can sign petitions online to get them shut down and free those helpless animals. We must be their voice. Spanish: Feliz Dia de san Valentín - Happy Valentine’s Day! French: Bonne St-Valentin! - Happy Valentine’s Day! Est-ce que tu as un plan?..........................Do you have a map? Je me suis perdu dans tes yeux…………...I’m lost in your eyes. How Many Women Does it take to ________? The other day in class I heard an interesting question, or a joke, if you will: “How many women does it take to _________?”. We all know the joke. But was there not women in the class? Now, this question was meant as a joke so it wasn’t a big deal, right? I mean it’s not like it was funny or even intelligent at that. But hearing that question made me think of a few of my own questions: “How many women does it take to spark a Civil Rights Movement?” (1: Rosa Parks, who was jailed for saying “no”). “How many girls does it take to help gain educational rights for women and girls in the Middle East?” (1: Malala Yousafzai, who was shot in the head by the Taliban for going to school). “How many women does it take to discover two elements and be the only person to win two Nobel Prizes in two different sciences?” (1: Marie Curie, who discovered Polonium and Radium, and won 2 Nobel Prizes). “How many girls does it take to strike out Babe Ruth and Lou Gehrig, one right after another?” (1: Jackie Mitchell, at 17, who struck them both out and then was told that women were not allowed to play Major League Baseball). “How many women does it take to lead the French army when no one else would?” (1: Joan of Arc, who was successful, yet still was burned at the stake for her actions). “How many women does it take to score 184 goals?” (1: Abby Wambach, who holds the record for most goals scored between men and women). But the most important question that one could ask is: “How many people does it take to stand up against sexism?” 1, and that 1 person can be you. Whether it is through speaking, writing, or any other means, your words are powerful. So watch what you say, because for some, what you say could be funny, or not even be a big deal, but when what you say questions the intelligence of half of the human population, along with your classmates, peers, friends, girlfriends, sisters, and mothers, it’s not funny- it’s inaccurate. Feautured below are different ways to say Merry Christmas across the world! ​Art is the expression or application of human creative skills and imagination, typically in a visual form such as painting or sculpture, producing works to be appreciated primarily for their beauty or emotional power. Everyone has their own interpretation of what art is. Imagine the world without art. At first, you can think “so what?” Take a deeper look and consider how much art is all around us, from the graphics in your favorite video game to the design that is on your shirt you chose to wear this morning. Everywhere you look there is art, and not many people realize or take the time to think that art plays a huge role on our everyday lives. For some people art is everything to them, it motivates them to get out of bed each morning. Artists create and design things to express themselves and be creative. Everyone has their own inspirations when creating art. Hannah McCartney finds inspiration from her Aunt Brenda, whereas Morgan Orr finds her inspiration through Mrs. Irwin. 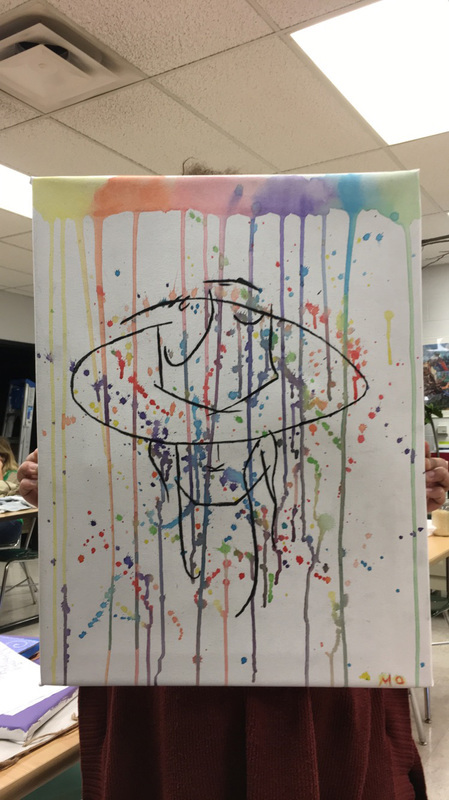 Over the years she has felt like she was bad at art, however, Mrs. Irwin showed her that she can express herself in other ways with art that aren’t drawing. Everyone is artistic in their own ways, you don’t have to be good at drawing or painting to be an artist. Featured below are phrases written in French and Spanish that our foreign language teachers have shared with us this month, some hold a special place in their hearts, and some simply sound very interesting! This quote was given to Señora Harring on a plaque by her dear friend Mrs. Chamberlain. She keeps this plaque on her desk so she sees it everyday and it reminds her of her friend. While Madame McDaniel has a strong love for all of the French language and it’s vocabulary, the word enthusiasm stands out to her as an especially beautiful word. Señora Towner will admit that this quote might be a little cheesy, but that’s all right! Some of you may recognize this phrase—as it was taken straight out of the textbook—but Señora Towner just couldn’t choose something she liked any better than this! 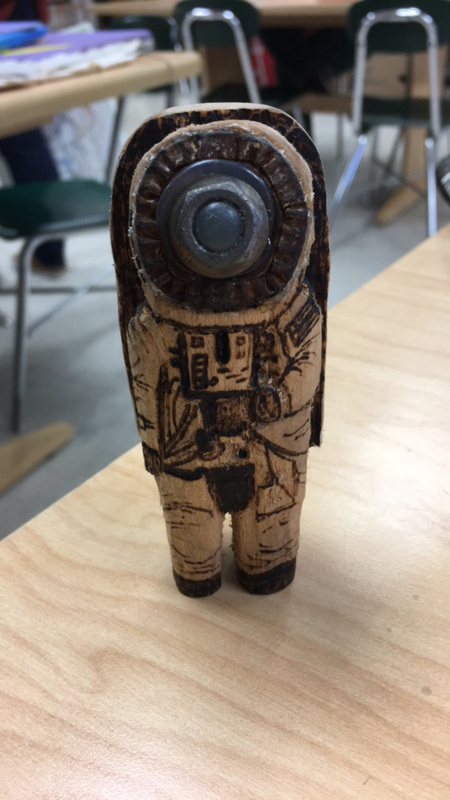 In advanced art Hannah McCartney has been working on a project that shows what dehumanization means to her. 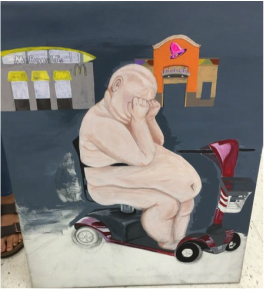 She named her piece “On the Threshold of Dehumanization.” This work of art is showing how people are dehumanizing by being lazy, not caring about themselves, and eating unhealthy. The American society is promoting bad lifestyles. ​Katie Carver is creating a painting that focuses on the theme of dehumanization in advanced art, taught by Mrs. Irwin. She is showing that there are different parts in our world. In this painting a girl is trying to escape from the toxic world that we live in. Katie is showing how we are dehumanizing our environment.